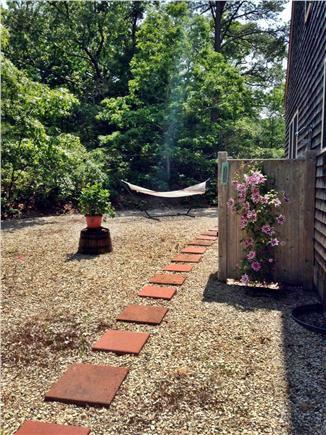 Our sunny and comfortable home is a ten minute drive from the towns of Edgartown, Oak Bluffs and Vineyard Haven. 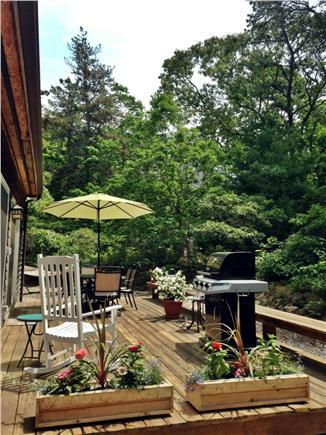 Abutting the State Forest, you can bird watch while relaxing on the deck. It is 3 miles from State Beach and 3 1/2 miles from South Beach. 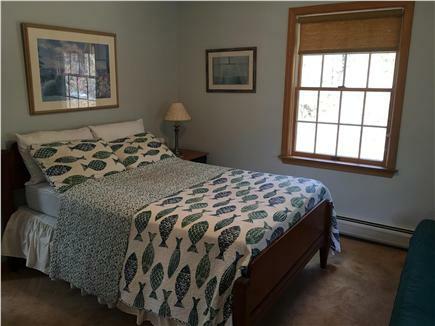 Located near bicycle trails and the Island shuttle bus route, the house comes with four bicycles and fishing rods. Skylights, large windows and sliders to the deck infuse the house with light. The first floor has a great room with large flat screen TV with cable and a Sonos sound system, an adjacent dining area, a large, fully equipped kitchen, and a bathroom with shower which is also accessed by a first floor bedroom with a full size bed and full futon. Washer and dryer are in a closet next to the kitchen. 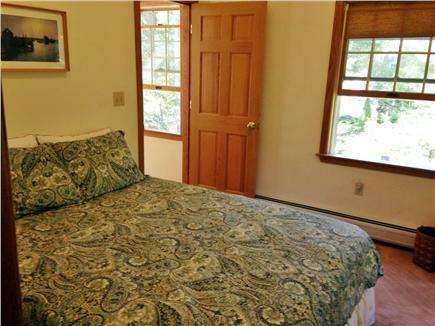 Upstairs, the large master bedroom with a king bed and TV shares a full bathroom with another bedroom with a queen bed. There are ceiling fans in every room and central air conditioning. A wonderful find for a combination of relaxation and fun! First floor bedroom and bathroom with shower. Home can be accessed by wheelchair coming in deck door. We stayed at this lovely home for the first time this year. The house was very clean when we arrived, which was the first thing I noticed when we walked in. 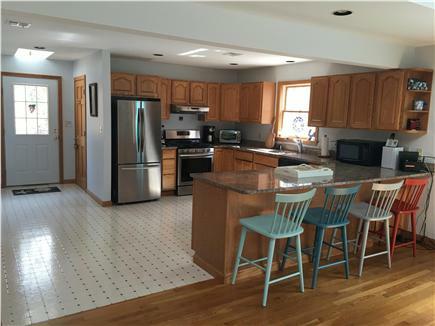 The kitchen is spacious and modern but the overall decor definitely has the "beach house" vibe. Had all the appliances we needed (washer/dryer, grill, coffee maker, etc.) and the central A/C was much appreciated during a muggy August week. My favorite was the outdoor shower, which was used every day! Beach chairs, a hammock and bikes available,and it was nice not to have to bring chairs that would take up space in our car. The yard had beautiful flowers and it was nice to sit on the back deck with a coffee in the morning. There isn't grass in the yard, but no matter as we went to the beach and parks and found plenty of open area there for our son and dog to run and play. 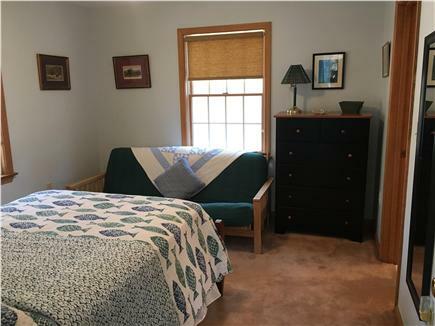 The master bedroom was large with a flat screen TV and skylights - if you like to sleep in and prefer darkness in the morning then you may want to choose one of the other two rooms which had less light. Personally I did not mind! The second bedroom upstairs was large enough to set up my son's pack 'n play so he could nap in there alone. 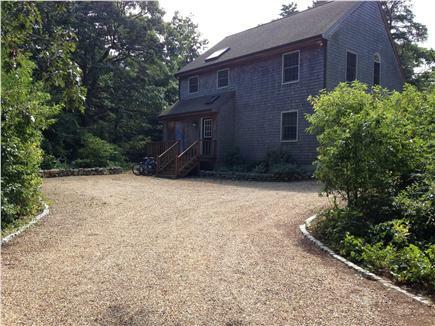 The house is in a nice location, Dodger's Hole was quiet but a close drive to downtown Edgartown, beaches, Oak Bluffs and Farm Neck. Great location for walking/running, close to the main road. Joan was helpful and accommodating during the entire process, we were so very happy to be able to bring our dog with us. She provided nice detail of the islands and restaurant/beach recommendations and forwarded emails to us about the events taking place during our week. She was quick to answer any question I had after we arrived. Really couldn't have asked for a better hostess! I have been traveling to MV for 6 years. Each summer I'm responsible for planning a girls trip. Well, this home was perfect. The privacy of location was an added bonus. The home was a spectacular, very modern yet classic beach home. The owner was responsive and easy to work with as well as very thoughtful. I really can't find a word to describe this home other than amazing. This home was an ideal retreat for our family! 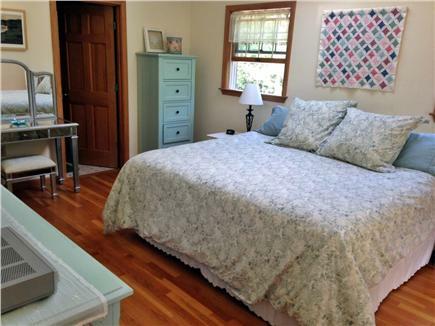 The home is centrally located, modern, nicely appointed, fresh and clean. It is absolutely vacation ready with bikes, beach chairs and so much more! The owner added a personal touch by notifying us about all the events in and around town. 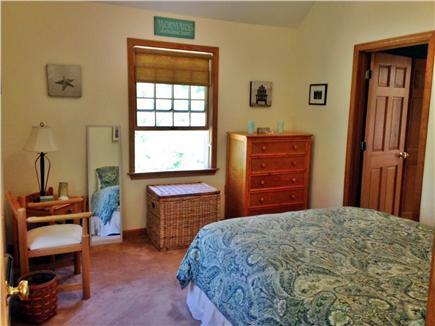 This lovely vacation home in Edgartown is on the list for a repeat visit. A beautifully kept property with lovely amenities. For someone who loves to cook, the kitchen was a dream - large and spacious with great appliances! The outside is nice and private to enjoy coffee in the morning as well. I couldn't recommend this home enough. You would be lucky to stay here! The house was wonderful, all appliances and amenities that anyone could need, as well as spacious and beautifully decorated. Lots of privacy, large deck to enjoy watching the birds and wildlife. Very peaceful, quiet neighborhood, good location, easy access to all areas of the island. Hope to return next year! What a wonderful few days we had on the Island! Your house was just perfect. We loved sitting on the deck watching the birds - we fed them while we were there. Saw blue birds in the morning and chickadees in the afternoon. And the hammock was so relaxing! We spent our days at the beach and exploring- the weather was perfect - and our nights eating good food! Martha's Vineyard was still as lovely as I remembered it from 22 years ago!! Thanks for such wonderful accommodations! "First of all, what a lovely home. For the week my family stayed here, it felt like a home away from home. It was only our first time on the Vineyard, but it was marvelous! The outdoor shower was wonderful! Also we spent the whole week working on one of the puzzles (the seascape one). All the games and books were wonderful to have! Plus the decorations were just so perfect for a home on an island. Overall, the week spent here was an amazing time! I hope everyone else who stays(ed) here enjoyed it as much as us! Thank you very much for lending us your home! We ended the week here by watching Jaws and after all the sightseeing, it was perfect! I came to the Vineyard for the first time in Summer 2005 with my husband and young daughters. We were enchanted! Sunsets at Menemsha where the girls collected shells, wading in Lake Tashmoo and swimming in the beach, feeling awe at the Aquinnah cliffs, wonderful restaurants and shopping; our first visit left us wanting to come back and discover more of this beautiful island. And so we did the next year, and the next, and still do each time finding new beaches and wonders of nature. We rented different houses each year in different towns. Soon summers were not enough. One year we discovered the magic of the Vineyard in the Fall, without the crowds. As soon as we could, we bought our own house and now know the magic of Edgartown at Christmas and New Years and the beauty of empty beaches in the Fall, Winter and Spring. We come up in every season. We no longer have to buy the new stuffed dog of the summer at the Black Dog Shop because the girls drive themselves to the beaches and towns to tan and shop and the house is often filled with young adults. Our oldest comes down from college in Boston to meet us on long weekends. Other times it's romantic dinners for just my husband and myself. For us, the ferry is the magical transition to our special sanctuary. We love our Vineyard home. The first time I saw this house, I knew it was the one for us. I was so sure that I made an offer that day without my husband or girls seeing it and once they did they all agreed. Skylights and windows infuse the house with natural light. It is spacious and open and feels much bigger than the pictures show. It is also remarkably private for its central location. The house is on a cul de sac which removes it from the road. This, and how it abuts the State Forest in the back, gives it an exceptionally private feeling. In the summer, you cannot see any of the other houses around it. 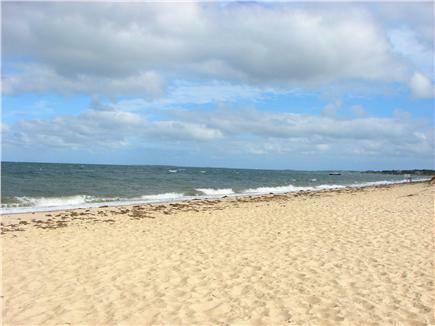 And yet, it is ten minutes from the towns of Edgartown, Oak Bluffs and Vineyard Haven. We have several bird feeders in the back and sitting on the deck and watching the birds or meditating to their songs is exceptionally peaceful and renewing. Our home is minutes from Felix Neck Sanctuary where we frequently walk on the beautiful trails. State Beach is the closest beach and one of the best for families. We have our choice of the three main towns and all they have to offer. Edgartown, with its stately white old whaling captain's homes draws us to its beautiful Lighthouse, upscale restaurants, and great shopping. South Beach, with the wilder surf, is the favored beach now that my girls are older. We go to Oak Bluffs when we want more of a relaxed, partying scene. I love the art district, the craft shop, and wandering around the marina. And again, the fabulous restaurants. Vineyard Haven, is also a favorite place for shopping and relaxing in a cafe. However, while these towns are the closest, we are regularly visit Up-Island, never tiring of the Cliffs at Aquinnah, sunsets at Menemsha, the Artisan's Fair or the Chilmark Flea Market.